Hey, baby, check out my plumage! A male peacock struts his stuff for a peahen. Image: Roslyn Dakin/PLOS One. Male peacocks shake their brilliantly-hued, long tail feathers to attract females in a courtship display known as “train-rattling.” But scientists had never closely examined the biomechanics behind this behavior—until now. A new paper in PLOS One concludes that the frequency at which those feathers vibrate can enhance this iridescent display—even as the eyespots remain almost perfectly still. 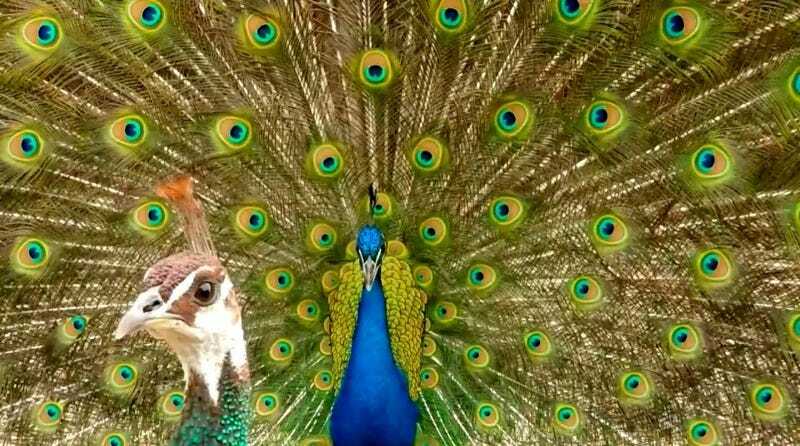 The courtship behavior of peacocks is well known, and until quite recently, scientists had assumed that the female of the species (peahens) simply preferred males with longer feathered trains and more eyespots—the more brightly colored, the better. Precisely how the males produced those shaking displays wasn’t deemed an important factor, which might be why nobody bothered to investigate the matter. More recent research indicates the peacock courtship process might be quite a bit more complicated than this. For instance, the displays do seem to capture peahens’ visual attention, but eye-tracking studies showed that they aren’t spending much time gazing at the edges of the male trains, or at those brilliantly hued eyespots. Some other factor could be at work. Lead author Roslyn Dakin, a biologist at the University of British Columbia, was the first to film these courtship displays on high-speed video. Haverford College physicist Suzanne Kane saw the footage and realized it looked a great deal like the phenomenon of resonance in physics. Every material object has a natural resonant frequency at which it vibrates. If there is another object nearby that is sensitive to the same frequency, it will absorb the vibrations emanated from the other object and start to vibrate in response. Not only does this produce a telltale rattle, but it has a unique visual effect: the background feathers appear to shimmer while the eyespots barely move at all. The first step to answering those questions was to quantify the patterns of the feathery motion. Back in the lab, the team mounted single feathers onto mechanical shakers to measure how they vibrated in response to shaking. They found that the longer the train feathers, the faster the males would shake them during courtship displays—perhaps to demonstrate their superior muscular strength. However, they also vibrate their feathers at or near the natural resonant frequency, enabling them to produce strong displays while using the least amount of energy. Kane draws an analogy to a child on a swing. Simply pull the swing and let it go, and it will swing back and forth at its natural resonant frequency. Time the additional pushes just right, so that they are at the same frequency, and it will swing even higher and faster. Push at just above or below that frequency, and your efforts will have very little effect on the swing. “That’s what we mean by saying that resonance is the most energetically efficient way to make something vibrate,” Kane told Gizmodo. If there’s very little friction in a given system—like a child on a swing—the range of resonant frequencies will be very narrow, making it more difficult to produce stronger vibrations. But peacock feathers rub up against each other all the time, so they produce lots of friction. 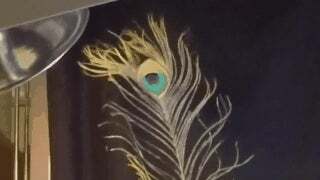 That means a peacock can shake his tail feathers at a wider range of potential resonant frequencies and still be reasonably energy efficient. One such resonant frequency is used in train-rattling, while another corresponds with train-shivering. This is not the first time physicists have been fascinated by peacocks. In the 17th century, Isaac Newton thought their vivid, iridescent colors were the result of the same phenomena that causes similar shifting colors in soap bubbles and oil films. His contemporary, Robert Hooke, was the first person to examine peacock features under a microscope, noting the ordered structure of their barbs, and how they served as tiny hooks to let the individual feathers function as a whole. To discover why the eye spots seem to stand still during rattling and shivering, co-author James Hare followed in Hooke’s footsteps, albeit with modern technology. He imaged peacock feathers using scanning electron microscopy to get a closer look at their highly detailed structure. This revealed that eyespots have a slightly different structure than the other feathers in the tail. Specifically, their barbs, or micro hooks, are locked so tightly together that they are denser that the surrounding feathers, which have looser barbs. These new findings may have some interesting implications for sexual selection in the species. Back in the 19th century, Charles Darwin observed that “Peacocks and Birds of Paradise rattle their quills together, and the vibratory movement apparently serves merely to make noise, for it can hardly add to the beauty of their plumage.” Now it seems this might not be the case.